Some individuals go into dental school already knowing what area of specialty they want to go into. Conversely there are some who figure it out as they matriculate, and there are others who are just not sure what to specialize in, if at all. When the third year of dental school comes around the halls are usually abuzz with chatter of people applying to various specialties. It's a worry-filled, yet exciting time for many. There are always the bunch wanting to specialize in Oral & Maxillofacial Surgery, Orthodontics, Pediatric Dentistry and Endodontics. Then there are the handful that chooses to go into the less popular areas such as Public Health and Radiology, to name a few. But how exactly do you choose a specialty or even know that you want to specialize? Shadow dentists and specialists - this will give you direct insight into the daily life of that specialist. Yo will see first hand the different procedures performed, different treatment modalities and how cases are managed. Internships/externships - these are usually done in an academic or hospital setting. This offers insight as to what a typical day in residency is like and often times go more in depth on the different treatment and procedure that are done. Consider Compensation - although personally I believe one should go into a specialty that they are strongest in and that they enjoy, some individuals regard compensation quite highly. Check the average salary for a certain specialty in your area. You might even consider moving to a different state if the compensation there is better. Consider Lifestyle - the lifestyle of specialists can be quite different so do some research to ensure you know exactly what you're getting into ahead of time. Oral & maxillofacial surgeons typically lead quite busy lives depending on the type of practice they go into. During their residency years (4-6 years post dental school) they might be on-call and have less flexible schedules than say an Orthodontist who's typical week comprises of 4 work days. All in all, ensure your research is thorough before you make a decision on any area of specialty. You may even want to consider being a general dentist for a few years before deciding that you want to specialize. At the end of the day, make sure that you are well informed about a specific specialty before going into it. 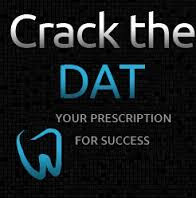 No doubt dentists have to be proficient in cavity preparation, it is part of our basic training. But just how to we master the cavity prep? 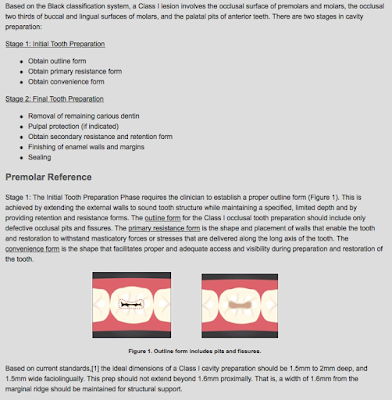 I have laid out the steps for the Class I cavity prep on the blog over at TheNEXTDDS, follow the link or click the image below to learn more. I am VERY excited to share the publication of the Journal of Implantology 2016 Glossary of Terms! The Glossary is a curated collection of terms and their definitions written by dental professionals. In other words. it's a reliable resource to students and professionals alike. Perk: It's available online! Click here or the infographic below to navigate to the Glossary. 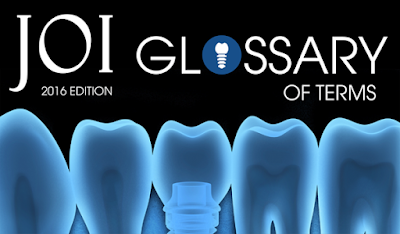 The JOI Glossary of Terms, 2016 Edition – a specialized collection of words, phrases, and definitions found in general dentistry, implantology, and oral surgery. Updated with over 1,500 terms, it’s the largest and most comprehensive edition of the Glossary yet. The Glossary is available for free as a digital flipbook, which is enabled with HTML5 and easily accessible through a PC, tablet, or smartphone. The Journal of Oral Implantology is the official publication of the American Academy of Implant Dentistry. It is dedicated to providing valuable information to general dentists, oral surgeons, prosthodontists, periodontists, scientists, clinicians, laboratory owners and technicians, manufacturers, and educators. The journal distinguishes itself as the first and oldest journal in the world devoted exclusively to implant dentistry. For more information about the journal or society, please visit www.joionline.org. Follow the links and/or graphic above to access the 2016 edition of the JOI Glossary of Terms. 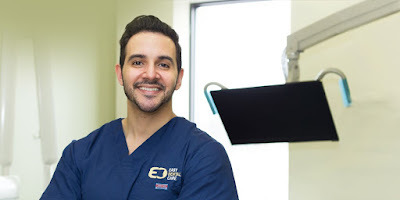 Valuable Lessons From Successful Dentists That Have "Been There, Done That"
As dental students and young dentists we want to know that we made the right choice in our career decision and we want to know of things that will ensure of success. A great way to gain insight on this is to learn from people who have gone before us and have "been there and done that." We can learn a lot from what makes them successful in their practices and sometimes, unfortunately, from their misfortune as well. Thanks to Dr. Ahmed Ezzeldin who put together an expert roundup of 21 successful dentists in the following infographic where they share their secrets on how they've built a successful career. Dr. Ahmed Ezzeldin is a General Dentist with advanced training in several areas of dentistry. He is owner of Easy Dental Care in Gainesville, Virginia. 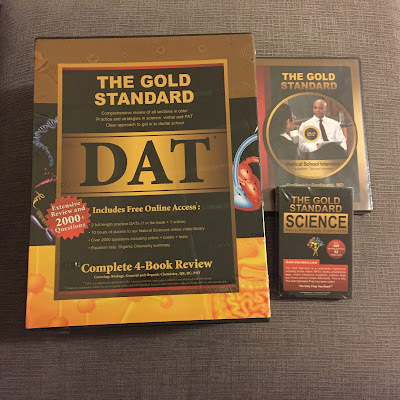 The Gold Standard DAT is an awesome addition to your DAT prep armamentarium! I was given the opportunity to review the products and there is much to be said about them. 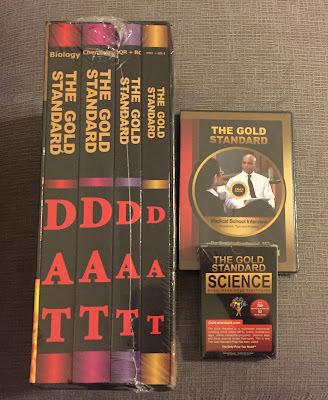 The Gold Standard brand has been around for quite some time and has been a house hold name in the medical field, particularly with MCAT prep. 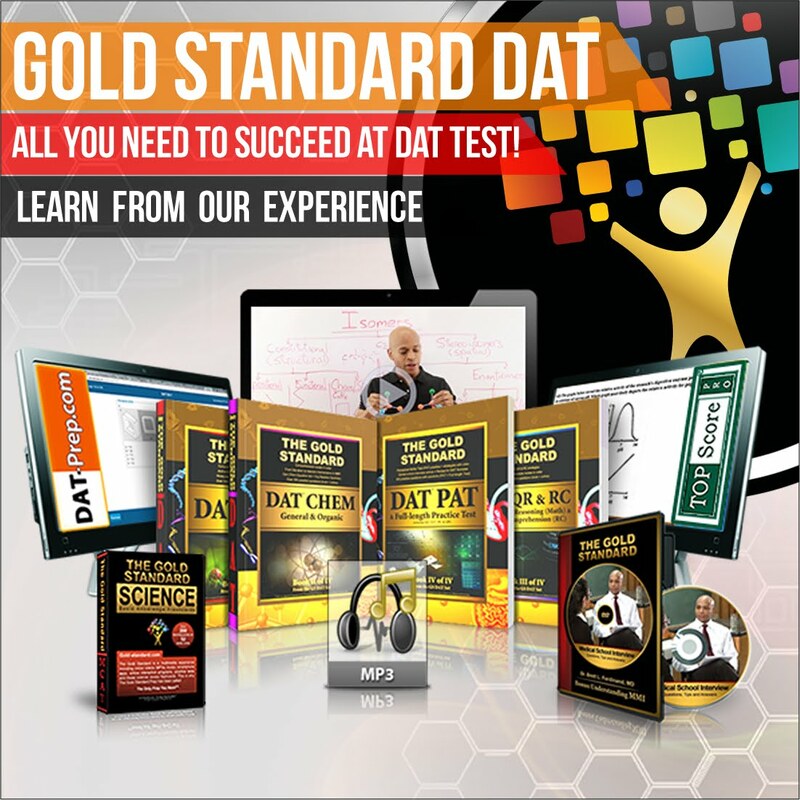 It is fairly new to the DAT arena with it's launch of DAT test prep materials around early 2013. 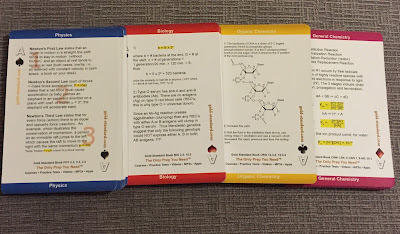 Since then, it has been a great contender among popular DAT preparation materials. 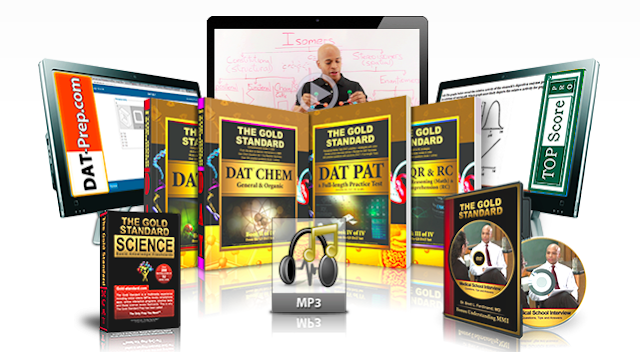 If I were to describe The Gold Standard DAT package in one word it would be COMPREHENSIVE. I spent a couple weeks going through the materials because I really wanted to do it justice. Upon opening the package that I received, my initial reaction was one of awe. Before I opened any of the books I was taken aback by 1) the packaging: the books come enclosed in a hard covered box that keep the books nice and secure and 2) the quality of the books/pages: the book covers are of really high quality with a matte finish; and the pages are thick and glossy which makes the illustrations, pictures and diagrams really pop. I have honestly never seen test prep materials of that kind of quality. One of my first thoughts was "wow, someone really paid attention to detail and someone really cared about the quality of products that they produce." As I perused the pages of each book, I realized that those sentiments were not only true for the packaging and pages but also of the information within the pages as well. The materials are, as stated before comprehensive. 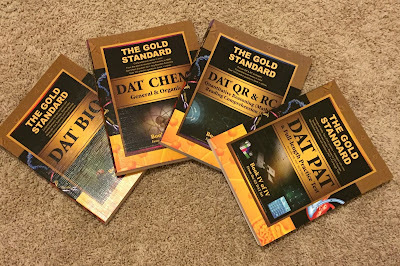 The Gold Standard DAT takes on a multimedia approach with their collection including textbooks, MP3s, Videos, flashcards, online resources, etc. It does not skimp on the details but is concise and to the point enough that it is easy to go through. 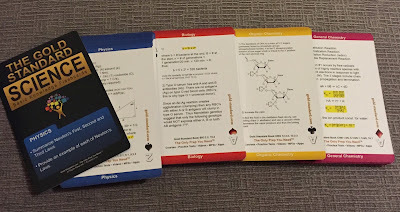 The books are broken down into pretty short chapters which has practice questions at the end of each with solutions provided throughout the book. 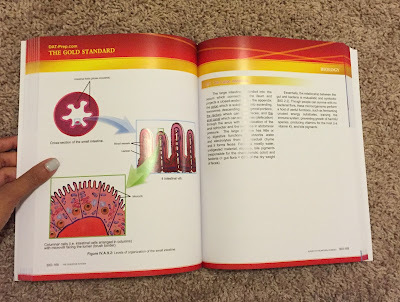 The illustrations and pictures on each page are also well depicted. Not only do you receive books with good, solid and pertinent information to do well on the DATs but many tools to augment your studying and to continuously test yourself throughout your preparation process. 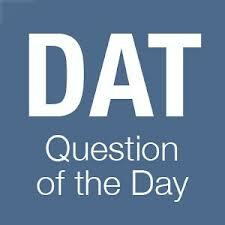 It has been several years since I took the DAT exam and I am sure there have been some amount of changes. If I were taking the DAT around this time I would honestly consider The Gold Standard for my DAT prep. While the prices aren't the lowest, there are several packages that you can choose from based on what fits your budget, your need, and/or your study habits. Plus, I am of the belief that you get what you pay for. 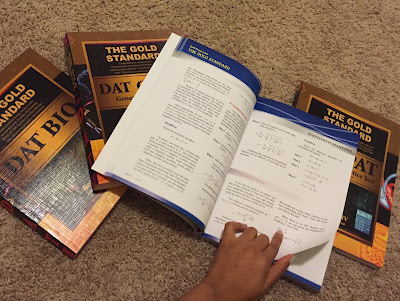 If you like going through textbooks then perhaps the four (4) book set will work well for you. It does come with 2 full practice tests. Likewise, if you prefer software and/or other online tools there are options for that as well. I think the different packages cater to each individuals' study style. I have outlined all the packages below for your convenience, and I must mention that all their items are currently discounted. You made it to dental school and you are now a D1! The fun begins now and the pace will pick up very rapidly. There will be many obstacles to overcome over your tenure in dental school, one of the first ones will be mastering the art of note taking. 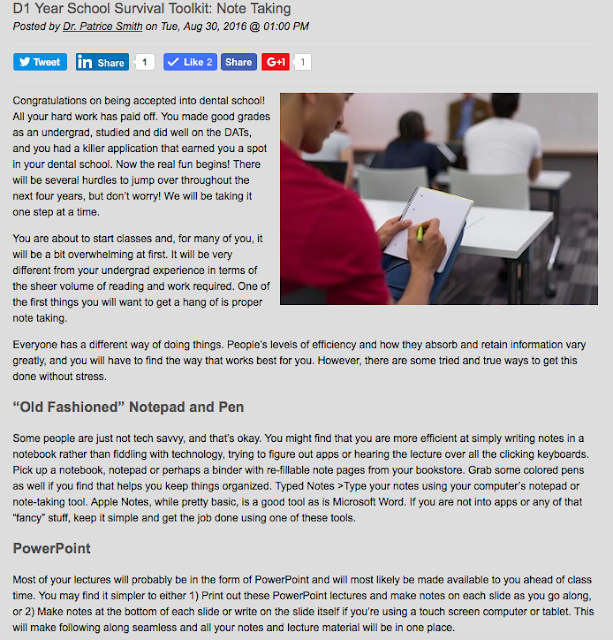 Luckily, I went over the different ways you can go about taking notes. The article can be found on The Next DDS website, but you may find an excerpt below. Remember, you all can become members of The NEXT DDS! It is absolutely free to enroll.